Preheat oven to 350ºF. Slice each squash in half lengthwise. Scoop out any seeds and pulp. Place cut-side down in a 9″x11″ baking dish, and add enough water to fill it about 1/2″-1″ deep. Bake for 45-60 minutes. Meanwhile, bring 4 1/2 cups water to a boil. Add vegetable bouillon, brown rice, and wild rice. Simmer brown rice and wild rice over medium-low heat for 45-60 minutes. Sauté the celery in the olive oil over medium-high heat for 3-4 minutes. Add onion and continue sautéing for about 5 minutes. Next add the carrots, and continue cooking for another 2-3 minutes. Finally, add the cranberries and spices. By now the squash should be about done. 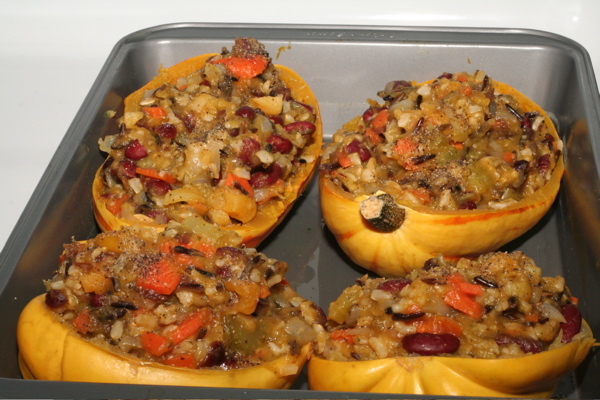 Remove the squash from the oven, and carefully scoop out most of the flesh from the shells into the vegetable mixture. Next add the rice mixture to the vegetable mixture (you may need to transfer to a larger bowl). Add the kidney beans and any additional seasoning to taste. 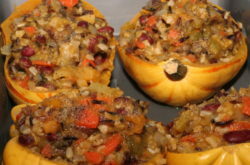 Then place the stuffing mixture into the shells. Place the shells in the same 9″x11″ baking pan, now with the cut side up. Add a bit more water to the pan if necessary to prevent burning. Bake for an additional 30 minutes at 350ºF. 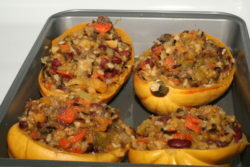 Instead of baking immediately, it is possible to put the stuffed squash in the refrigerator overnight, and then bake the next day. If so, bake slightly longer (about 45 minutes).